Since launching their nationwide gourmet birthday cake delivery service in 2005, Bake Me a Wish has had the simple goal of bringing joy and excitement back to holidays and special events through delicious food gifts. They have now expanded their gourmet baking empire into brownies, and have the perfect brownie gift for every occasion and event. A gourmet bakery specializing in delivering beautifully-packaged gourmet gifts directly to your door. We are happy to see that Bake Me A Wish has now expanded into crafting decadent gourmet brownies. Perfect for those that love the classic flavors, their six offerings include fudge walnut, peanut butter chip, raspberry crumb and cheesecake. Since this vendor got their start in baking birthday cakes, we were not surprised to see their two brownie cake options for purchase. These decadent brownie cakes come in triple chocolate enrobed and cookies and cream. Bake Me A Wish focuses their business on curating gift sets for every event, and their delicious brownies are not available for individual purchase; however, if you are looking for a gift, you have come to the right place! Bake Me A Wish offers several brownie assortments and samplers, certain to satisfy any sweet tooth in your life. They carry several classic brownie samplers and assortments and also have gift packages that include their classic brownies, brownie cakes and other goodies! Since brownies make up only a small portion of this bakery’s sweet treats, they do not carry a large selection of flavors and options compared to specialty brownie vendors. Brownies are not available for individual purchase, and all samplers are geared towards gift giving, which is perfect for special events, but not ideal when shopping for yourself. They also do not offer gluten-free, vegan or sugar-free options. Bake Me A Wish takes the craft of baking seriously, and only use the highest-quality ingredients like German chocolate, pure cane sugar and the sweetest butter. They believe that the finest ingredients make the most delicious gourmet treats. Although their brownie selection is limited, anyone who is a fan of traditional brownie flavors and recipes will love Bake Me A Wish. Their brownie offerings including six brownie flavors and two brownie cake flavors cover the most-loved and classic varieties. Unfortunately, they do not incorporate exotic ingredients or fun seasonal items into the brownie portion of their bakery. If seasonal treats are your thing, they do offer their cakes and cupcakes with unique décor for whatever the current season may be. As mentioned above, they do not have gluten-free, vegan or sugar-free options at this time; however, all of their goodies are certified OU Kosher. Bake Me A Wish does not have a brownie of the month club at this time, which is a gift option we would love to see. With their gourmet brownies and brownie cakes, we are certain this is something we would enjoy receiving on a monthly basis. Since these delightful brownies are not available for individual purchase or in small quantities, this club may not be ideal for those on a budget. The bakery’s scrumptious cookies and cream brownie cake is their lowest price point, starting at $34.99. For $39.95 customers can purchase their triple chocolate enrobed brownie cake, singular sensation 4-pack (of 4-inch brownie cakes) and gourmet brownie sampler (includes eight pieces). 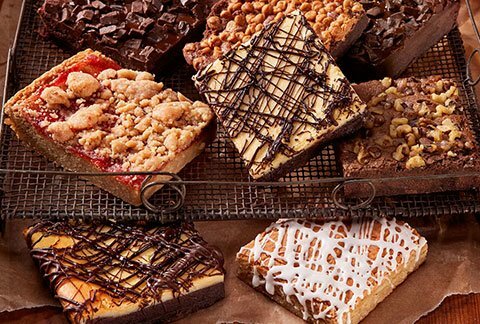 An assortment of one dozen gourmet brownies starts at $49.99. They also offer four assorted samplers which include brownies as well as other savory sweets from their bakeshop. These gift sets range in price from $59.99 for their assorted gourmet brownie sampler and one dozen cookies to $74.99 for one dozen gourmet brownies and two dozen cookies. Unfortunately, due to their large-nature, Bake Me A Wish does not guarantee that all products are baked and shipped on the same day. However, they ship all items in a timely matter to make sure customers receive their baked goods while they are fresh. Bake Me A Wish wants their customers to enjoy their gourmet goodies in their freshest form, which is why they spent almost a year trying out different shipping methods and consulting with engineers to find the perfect delivery method. They use a variety of techniques, depending on the season, such as dry ice, ice gels and polystyrene to ensure you receive fresh brownies with no melting or breakage. Shipping is not complimentary, but their festively packaged gourmet brownie samplers and assortments ship at a flat rate of $9.99 for 2-day express shipping. Overnight shipping is available for $14.99. Priority/Morning delivery (before 12 p.m.) and Saturday delivery are available for $24.99. We like that the shipping is not based on the purchase amount, but is standard for all purchases. As previously discussed, Bake Me a Wish is geared towards helping you find the ideal gift for every occasion. They offer two brownie cakes and one brownie cake sampler, which includes four miniature cakes. They also have two brownie assortments, available in eight and 12 packs. Additionally, they have four gift assortments that include their brownies in addition to their other popular baked goods. All of these gift sets are packaged carefully into their signature gift boxes, and include a personalized gift card. Each gift can also be customized for 12 different occasions and events, some of which include: Happy Anniversary, Season’s Greetings, Get Well Soon and Best Wishes. Bake Me A Wish has all of their delectable gourmet gifts available for corporate gifting. Their elegant packaging can be customized to include your company’s logo or name, and a personalized greeting card is included as well. Bulk discounts are also available with their business gifting program. This vendor has business gift representatives ready to help you find exactly what you are looking for. Bake Me A Wish is dedicated to providing excellent customer service, and can be reached on their toll-free number as well as through email with questions, concerns and comments. They do not currently have a live chat option. Orders can be placed securely through their easy-to-use website or via their toll-free number. Their interactive website has a thorough FAQs section, which will answer most questions about shipping, ingredients, packaging and more. Their website also includes a blog with gift recommendations and other fun content. Bake Me A Wish is dedicated to making every occasion extra special with their wonderful assortment of baked goods. They are the ideal bakery for those looking for festive gift assortments and sets. Due to their emphasis on gift packages, this vendor is not ideal for those who want to buy small quantities or individual brownies. Their classic brownie flavors are perfect for those that love traditional-style brownies, but may not satisfy those that crave exotic ingredients or funky formulations. This is also not the place for those with dietary restrictions, as they do not currently offer any vegan, gluten-free or sugar-free varieties. We love Bake Me A Wish’s commitment to bringing back childhood joy to Birthdays and other special events. Their samplers and assortments are beautifully packaged, and we like that they are customizable for a variety of events. They take the guess work out of holiday shopping. Although Bake Me A Wish has a solid selection of classic flavors, we do not like their small variety. Their limited flavor options leave something to be desired. We also wish they had their brownies for purchase in smaller quantities or individually, for those of us that are not shopping for a gift. We also do not like that they don’t have any gluten-free, sugar-free or vegan varieties. This award-winning bakery really knows how to make any occasion extra special with their high-quality baked goods. Their beautifully-curated gift sets with customizable wrapping options make shopping for every life event a breeze.